THIRTY MILLION READERS WORLDWIDE. INCLUDES EXCLUSIVE NEVER BEFORE SEEN CHAPTER. The world is different now. There are no rules, no governments, and no guarantees that you’ll be saved. Rival factions have taken over, fighting each other for survival with no loyalty to anyone but their own. At 21, Hayden has taken over Blackwing and is one of the youngest leaders in the area. In protecting his camp from starvation, raids from other factions and the threat of being kidnapped, he has enough to worry about before he finds Grace. The daughter of the head of the rival camp Greystone, she is slow to trust anyone, much less the leader of those she has been trained to kill. This is danger. This is chaos. This is anarchy. 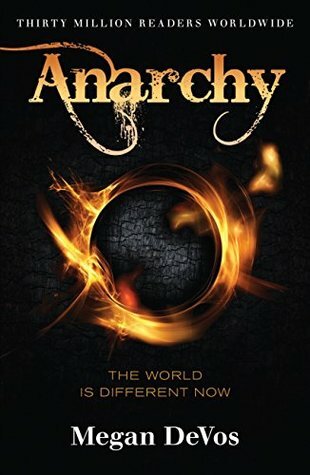 Well, I am completely taken aback and pleasantly surprised by Anarchy, I was expecting it to be a typical YA type novel with characters I could love to hate and an overused, tired plot base but wowee was I wrong! Anarchy began and ended with a bang, characters that rocked and a plot base to rival many a bestseller. In Anarchy, the world has basically ended. “No rules, no government and no guarantee that you’ll be saved.” The city has been split into sections with each section belonging to a faction- Blackwing and Greystone are the key players in this book. Hayden is the leader of Blackwing and he is the one of the youngest leaders in the area, his base camp is in prime location to know everything that happens around them. He’s young, but forced to grow up too quickly he’s also a force to be reckoned with. His best friends Kit and Dax also the same but with their own unique quirks that make them their own kind of special -weapons master, tech guru you name it. They’ve grown up together and go on raids together. It’s on one of these raids into a rival camp for supplies that Hayden meets Grace – our leading lady. Similar age to Hayden, similar back story, only she’s the enemy and Hayden finds himself caught by her. Grace is the daughter of Blackwing’s rival camp Greystone and as such expected to pull her weight in this world that has gone to the dogs. But Grace is different – she doesn’t want to be like her brother or the others at the camp. Anarchy is a story of loss, finding love and learning that not everything is as it seems. It’s a fresh taste of war and clashes between factions. It’s new beginnings in a world that doesn’t do them any favours. I was pleasantly surprised by the content of this book. As I mentioned above I was expecting a typical YA novel with a tired plot but I was taken aback by the romance in this book! I wasn’t expecting that! The writing style had a nice flow to it with an ease of reading and characters that were good and solid. I appreciate a solid foundation and characters and Anarchy provided this in abundance. Ultimately this was a book that kept on giving and I’m really looking forward to the next one and to see where the story goes. I so need a recliner. Easy crochet relaxation!